The Tribunal Temple is the native religion of the Dunmer of Morrowind. They worship Almalexia, Sotha Sil, and Vivec, known together as the Tribunal or Almsivi. Most people usually just call it "the Temple". They accept outlanders as members, but most of the few outlanders that do join, join only for the services provided. On Vvardenfell, the Temple District includes the city of Vivec, the fortress of Ghostgate, and all sacred and profane sites (including those Blighted areas inside the Ghostfence) and all unsettled and wilderness areas, as the Treaty of the Armistice with the Empire maintained the island as a Temple preserve. In practice, this district included all parts of Vvardenfell not claimed as Redoran, Hlaalu, or Telvanni Districts. The Temple maintains less than favorable relations with most of the Imperial guilds of Morrowind. However, it maintains strong relations with the pious House Indoril and House Redoran, and is friendly with House Dres and House Hlaalu. The Temple is an organization created for the worship of the Tribunal, also known as the Almsivi. The three demigods Vivec, Almalexia and Sotha Sil joined their powers to set up the Ghostfence, a magical boundary around Red Mountain on the island of Vvardenfell, to contain the spread of the Blight plague. The history of the Tribunal goes back to The War of the First Council, after which the then mortal Almsivi exploited Kagrenac's Tools to make themselves gods. Of the Great Houses of Morrowind, House Indoril is the one most deeply rooted in the Temple hierarchy, dominating both the priest caste as well as the Ordinators, who serve as guardians of the Temple. House Redoran is one of the most pious houses; Redoran Buoyant Armigers serve together with Ordinators as guardians of the Ghostfence and the Tribunal Temples. House Hlaalu, being dominated by Imperialised Dunmer, prays when it is convenient, maintaining the appearance of piety through lavishly-appointed structures. House Telvanni has little use for the Tribunal Temple, as the Magelords themselves are as ancient as the Almsivi, letting its temples become overrun with dust and squatter merchants. House Dres, being the most traditional of the Great Houses, ardently supports the Temple. Tribunal Temples are scattered all around Vvardenfell and most serve as return points for Almsivi Intervention spells. While many of the temples in outlying areas are freestanding structures built of packed mud in the Velothi style, it is not uncommon to see them adapted to blend in with local styles, be that built on top of Vivec's cantons, or even integrated into Telvanni mushroom structures. 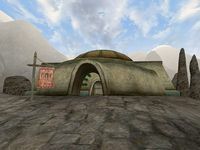 There are two Fanes on Vvardenfell: the High Fane on Vivec's Temple Canton, which houses the offices of the Archcanon and Temple administration, and the fortress-city of Ghostgate. The latter is the larger of the two structures with a wizard's tower forming each wing, but both feature an elevated central platform which holds an offering pit and one of each type of shrine. Those interested in joining the Tribunal Temple should speak to priests at the temples in Ald'ruhn, Balmora, Molag Mar, and Ghostgate, or with priests at the High Fane in the Temple Compound in Vivec. Once you are recognized as the Nerevarine by finishing the Third Trial, it is impossible to join until you have spoken with Vivec due to the Temple's hostility towards you and the Nerevarine Prophecies. If you are already a Temple member, you will not receive any new quests during this time, or receive credit for finishing any. If you are expelled from the Tribunal Temple, most guild members will recommend making amends and speaking with a Temple Master. The Temple Masters are Endryn Llethan, Feldrelo Sadri, Tharer Rotheloth, Tuls Valen, and Uvoo Llaren. You can also speak with the Patriarch, Tholer Saryoni, though he is behind some locked doors. Take note that a second expulsion is permanent. For more information, visit the Lore page. * Patriarch doesn't actually require the listed skills and attributes, as the final promotion is automatically given from the final Temple quest, Ebony Mail. Pilgrimage to Maar Gan: Perform another pilgrimage to the shrine in Maar Gan. Dark Cult in Hassour: Destroy a dark Sixth House cult in the cave of Hassour. Disease Carrier: Convince a pilgrim in Vivec who has Corprus to leave the city. Silent Pilgrimage: Take a vow of silence to perform a pilgrimage to the Sanctus Shrine, west of Dagon Fel. Shoes of St. Rilms: Recover these precious artifacts of the Temple in the depths of Ald Sotha. Foul Cult Beneath St. Delyn Canton: Eliminate this foul cult operating somewhere in St. Delyn canton of Vivec. Cure Lette: Cure a villager in Tel Mora of swamp fever. Pilgrimage to Mount Kand: Demonstrate your wisdom and bravery by visiting the Mount Kand shrine. Cure the Outcast Outlander: Cure an ill Ashlander in his camp nearby. Food and Drink for the Hermit: Deliver some food to the hermit Sendas Sathis on Shuran Island. Hair Shirt of St. Aralor: Recover this lost relic from Kogoruhn.